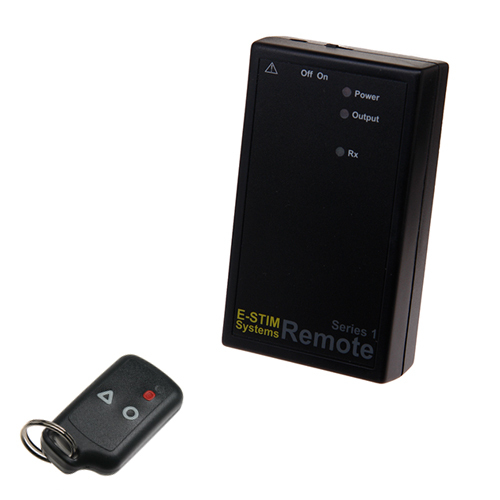 The Series Remote from E-Stim Systems. Now we have can offer the latest in E-Stim Technology with the E-Stim Systems Series 1 Remote Kit. With a wireless keyfob style transmitter and a small powerful and discreet electro stimulation receiver we can now offer effective electro stimulation via radio!!! Using a high quality digitally encoded transmitter and receiver (offering a range of upto 80M depending on environmental conditions), together with a dual microprocessor control system you can be sure that the Series 1 Remote Kit offers simple and powerful remote controlled electro stimulation at a reasonable price. And now it features the unique motion sensor. With 5 different control modes - Fire, Pulse, Continuous, Motion and Training everything is now easily controllable from the simple keyfob transmitter. We don't just offer simple control over the output level either. You can now control the subtle nuances of the output (pulse speed/pulse width) directly from the keyfob transmitter. It's easy as 123 (1-Fire, 2- Continuous, 3-Pulse)!!! The output is digitally controlled over 21 levels again easily selectable from the keyfob transmitter. With auto zero and over range indicators you can ensure you are in control at all times. Each Transmitter is digitally encoded to a receiver. The receivers built in learn function allows multiple receivers to work in combination with multiple transmitters, as well as the other way around. In other words one transmitter can control several receivers, as well as one receiver responding to several transmitters...The choice is yours. Due to the digital encoding system you can ensure that your receiver will not respond to other devices, unless of course you want it to. All this can be setup simply in seconds. The high quality microprocessor controlled voltage generator mean that batteries last longer and with a digitally generated pulse system you can ensure that the power is directed exactly where it is most effective. With built in current limiting, soft start controls and BiPhasic AC output you can ensure that the E-Stim Systems Series 1 Remote is designed with your safety in mind. The E-Stim Series 1 Remote is compatible with all E-Stim Systems electrodes as well as other electrodes manufactured by quality manufacturers. All units are shipped with a full no quibble 12 months guarantee. Imperial Receiver : 4 ⅓" x 2 ½" x 1 ⅓"